I am the blank canvas. dampen down my internal rage. a metaphorical pain that’s worse than violence. or make my page a fucked up blur. so I tell you now you have no dominion. and gather up the thoughts you think you stole. and try your hardest to install some vanity. and blind me from feeling what i’m seeing. beneath an emerald sky so starless. a seasoned traveler I’ve mastered the crashes. a tired mind empty and planless. that slip between the bars of the iron cage. devouring with passion my every sight. create the silence that I detest. where actually you’ll find crimson red laces. I am the blank canvas just waiting for treasure. So I have writers block or at least a form of writers block. I have so many different things swimming around in my mind right now that i’m having difficulty deciding what should fall to page and what should remain inside my head. 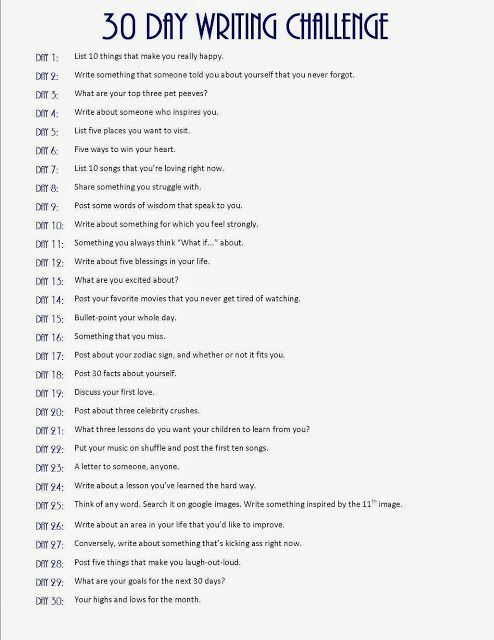 Such indecision is like poison to my creativity and so for now whilst I clear my mind I’m going to do a 30 day writing challenge :). This will allow me to continue writing whilst not having to delve to deeply into the new and fresh thoughts that are causing me so much chaos. It will also give everyone a great chance to get to know me better :).